Consider the irony of two genealogical societies, both of whom had posts written about them today memorializing one's success and another's failure. We would do well to shun one's model and follow the other's example. After 40 years in existence, the Sangamon County Genealogical Society is shutting down next month. Declining membership and dues revenue, as well as the abundance of genealogical information available on the Internet, all contributed to the group’s demise, its leaders said this week. Just one short year ago during our regular monthly meeting, members of the CGS board of directors took a look at the blog I created for the society and gave permission to go live. They were all wonderfully enthusiastic about the idea and have been supportive contributors throughout the year. I sold this experiment as a way to communicate with members and promote CGS at no cost to the society. So far, in my humble opinion, the blog is a success. So writes Kathryn M. Doyle, blogmeister and board member of the CGS. Some of the regular "columns" the CGSL blog features are Wordless Wednesdays, a post every Wednesday that does not have an accompanying written article, but instead shows one or more photographs of the society in action, whether at a meeting, a workshop, or assisting researchers in the library. Another feature is having members post a small series of articles about a research trip they've taken. Just like EWGS, the CGSL blog posts upcoming programs and summarizes their meetings for those who missed them or who live out-of-area. The CGSL is an example to follow, not just in its blog, but in the attitude, perspective, and vision of its board and members, which has allowed the society to not only adapt with the times, but be a leader and standard-bearer for other societies. So, EWGS members, how are we to respond? I hope that I am pricking the conscience of a few readers out there by insisting that we cannot survive if we continue to conduct the society "as we always have." I believe, by and large, that most of our membership and leadership is willing to go forward and this has allowed us to be successful thus far. But for those who are holding back, please consider the state of the Sangamon County, Illinois Genealogical Society--and many other societies which have recently gone by the wayside--and determine within yourself that this will not be the end result of the Eastern Washington Genealogical Society! The Internet education class scheduled for November 15, 2008 was postponed one week due to the sudden death of Gary Taylor, the EWGS treasurer. Juanita McBride was the instructor for a class on PERSI and NUCMC. PERSI is short for PERiodical Source Index and is done by the Allen County Library in Ft. Wayne, Indiana. Surname and Locality are self-explanatory; Methodology lets you search for articles on search methods. The last section is Bibliography and that lists all the periodicals in the Allen County library. It includes the EWGS Bulletin. If you find an article you are interested in, Allen County Library has an order form for copies. They charge $7.50 plus 20 cents a page for the copies. That form is with the online database here. Be sure to check our own library for the periodical, since EWGS has a large collection of periodicals and the article you are looking for may be in that collection. Dolly Webb brought an interlibrary loan form and said she had used it for items she had found in PERSI and using interlibrary loan is free. My suggestion is you can also send to whoever authored the periodical for a copy. I have received queries for copies of articles from the EWGS Bulletin that people found using PERSI. The second part of Juanita's class was on NUCMC (pronounced "nuckmuck") or the National Union Catalog of Manuscript Collections, which was created by the Library of Congress in 1959 and contains records about materials in public, university and special libraries throughout the United States. From 1959 to 1993, NUCMC was published in printed form. These books are in our genealogy collection at the library. The online version covers only records added after 1986 to the present. To access it you need an internet connection, and then click here. It brings up a screen with three columns: clicking on "search OCLC catalog" brings up Questions on Searching; or Simple or Advanced search. Juanita suggested a simple search for Ohio Quakers, and it brought up several pages of hits. Clicking on one allows you to find out more detailed information on whatever you are interested in. I do not have any Ohio ancestors so I tried Massachusetts Quakers and several pages of hits came up. NUCMC is a real unused resource. UPDATE: If you would like a copy of Juanita's syllabus, please e-mail Miriam Robbins Midkiff. I am very thankful for the Washington State Digital Archives, When I started doing research for EWGS Ray Fisher gave me some databases done by EWGS, all were old DOS databases, and I was worried they would fade away if not put into a newer format, the Digital Archives was happy to get the databases and today they not only have the indexes EWGS did, but actual images of the records. The other place I am thankful for is the Spokane County Auditors Office and staff, they are always very cheery and very helpful to me and other genealogists, Thanks Vicki Dalton and staff. Hamburg, 24th November 2008. The fastest-growing family network worldwide itsourtree.com got a new name: dynastree. The new name is easier to keep in mind and underlines the cross-generational aspect of the worldwide network. Co-founder Daniel Groezinger explains: “The new name is an international fusion of the words dynasty and family tree. It symbolizes our network’s essence: connecting the generations by means of the family tree.” Of course, the free network’s services will still be available using the domain itsourtree.com. The free genealogy network dynastree continues to grow rapidly: Until today, 60 million person profiles have been added to 6 million family trees worldwide. Future plans are the expansion to Russia and Turkey. Apart from the English site, the services are available in Germany (www.verwandt.de), in Poland (www.moikrewni.pl), Spain and South America (www.miparentela.com), Portugal (www.meusparentes.com.pt), Brazil (www.meusparentes.com.br), the Netherlands (www.verwant.nl), Italy (www.parentistretti.it) and France (www.familleunie.fr). The platform will continue expanding to other European countries as well as worldwide. Itsourtree.com is supported by leading Business Angels, Hasso Plattner Ventures and Neuhaus Partners, a well-known venture capitalist. Woman Wants Recognition for Spokane's Black U.S.O. Today, the building that housed the black U.S.O. stands empty. Washington Photo, a longtime business in Spokane that occupied the former U.S.O. building, closed its doors in August. A leader in Spokane’s black community wants the history of the building recognized and preserved, and has called for having it listed on the national or local registers of historic places to acknowledge the contributions of blacks and other minorities to the war effort. Read more about this effort to preserve Spokane's African-American past here. A historical photo slideshow is also available. It's a shame to see that the Campbell House will be closing due to lack of funds. Just over a year ago, a group of Eastern Washington Genealogical Society members took on a fun and exciting project researching the family history of the servants of the Campbell House. Here's hoping that restoration of funding will be swift. The Northwest Museum of Arts and Culture will close the historic Campbell House on Jan. 2 and lay off the mansion’s three part-time tour guides due to state budget cuts. Museum-goers will no longer be able to tour the historic Kirtland Cutter-designed mansion, although Dennis Hession, the MAC’s chief executive officer, said he hopes that school-group tours can continue. The Campbell House’s numerous holiday events in 2008 will continue on schedule. If you are a RootsMagic user, or are simply curious about this genealogy software program, you may be interested in the RootsMagic Users Group, which meets at 7 PM on the third Thursday of each month at the LDS Church at 808 E. Sitka (this month's meeting is on November 20th). Lew and Trudy Lundy lead this group. For more information, e-mail them here. 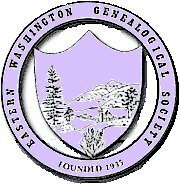 Due to the November 15th services for the late EWGS treasurer, Gary L. Taylor, the November 2008 members-only computer class, "Using NUCMC and PERSI to Find Your Ancestors", has been rescheduled to Saturday afternoon, November 22nd. Those who originally signed up for the 10:15 class time are now signed up for a 1:00 PM class, and those who signed up for the 11:30 class time are now scheduled for the 2:15 PM class. Juanita Linton McBride will be our presenter. If you have any questions, please contact Miriam Robbins Midkiff or Juanita Linton McBride (see member directory). November is American Indian Heritage Month, so I thought I would share a list of resources for local Native American research. This list was compiled by Larry Fine for the Colville [Washington] Stake Family History Conference held April 26, 2008. It was with shock and great sadness that we learned that EWGS's beloved treasurer, Gary L. Taylor, passed away quietly in his sleep last Wednesday night. He was 73. Only last Saturday, Gary and I were sitting together in our usual places at the front of the meeting room for the November 2008 General Meeting, with him receiving membership dues for the 2009 genealogical year and myself manning the Ways and Means merchandise table. Gary's dedication to his duties as treasurer, his willingness to help our society in diverse ways--including the last two rest stop fundraisers--and his sense of humor and broad smile will be missed by all. We send our condolences to his wife and family members. EWGS member Bill Ailes has been helping Mrs. Taylor with the arrangements, and reports that services will be held next Saturday, November 15th at 12:00 PM at Hennessey-Smith Funeral Home, 2203 N. Division Street. The November computer classes were scheduled to be held at the public library that day; we are looking into the various options we have so as to not create a conflict for those who wish to both attend the class and also pay their respects to Gary's family. We'll have a better idea by Monday, when I can speak with my contact at the library about a possible computer class rescheduling. Stay tuned to the blog, the EWGS mailing list, and your e-mail for further notifications. Gary's obituary can be read at the Spokesman-Review website here.